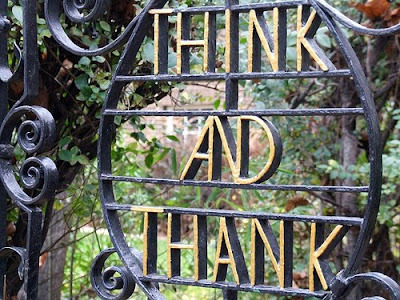 The words Think and Thank are inscribed in many of the Cromwellian churches of England. These words should also be inscribed in our hearts. Think of all we have to be grateful for, and thank (God, the Universe, All That Is) for all that we have. Good Thinking leads to good Thanking. Good thinking and thanking leads to good relationships in all areas of our lives. I was going to curse my truck, but think otherwise. While thinking as I'm drinking. & i'll drink to all this thanking. That's a good Pub Song, Sir D! Keep those feet off the ground. I agree with the writer from Stratford Upon Avon, what we think makes it so. The rub sometimes comes; however, when what I think and am thankful for is completely opposite of what another thinks and is thankful for. Case in point: I think that healthcare reform in necessary and I'm thankful that we are attempting to move forward with it. Sarah Palin still thinks that we are going to kill off old people and she's thankful that there our thousands who still support her. Think and Thank, Trash and Treasure, Right and Wrong...It's All Good to Somebody!